Ye gods, the news is depressing this week. Between Trayvon and Texas, I’m rather thoroughly hating my country at the moment. I think we could all use a moment of lighthearted relief. Kitty! Kitten! Combat! Bit of kitteh judo, here. That’s the scene round B’s house these days – at least when Kirby comes home. Poor thing has taken to hanging outside more, where he can sleep in peace. Luna spends most of her time when he’s not there snoozing so she can be wide-awake for her big brudder. I shot a video for your entertainment. Song kindly provided by STEEP. Rather gets in yer head and tumbles round like a kitten on the attack, dunnit? It’s no secret that Husband and I own property in the Eastern Sierra Nevada mountains, about five miles south of the intersection of highways 108 and 395. On our property, cliffs of granite come close to or against the hwy 395 road; this is called the Devil’s Gate, for the muddy grief it gave travelers during the pre-hwy-395 years. There are springs there. There’s a Spring creek there. Very annoying water, if you’re trying to take a wagon through the Gate in June, and there’s no hwy 395 to help. Relatively near the gate, there’s an alluvial fan with a creek that runs for a couple of months in the Spring. We’ve chosen a building spot on the fan, well uphill from the creek, but not so close to the granite wall that it could drop large rocks on us. Down by hwy 395, there’s a low spot. It wasn’t there before the construction of hwy 395 in the ’20s — the road builders should have put in a culvert — and we got a county permit to fill it in with the excess excavation material from our home site. Then someone complained that we were filling in a wetland. The expert we hired from an independent firm has not yet released her results, but her preliminary finding was that it was probably not a wetland under Federal law, but might well be under California law. At this point we’re just hoping we don’t have to mitigate the damage already done to the “wetland”. We have REAL wetlands on our property on the other side of hwy 395, fed by those springs, and we’re as determined as anyone to preserve them. But this is just a Spring mudhole. 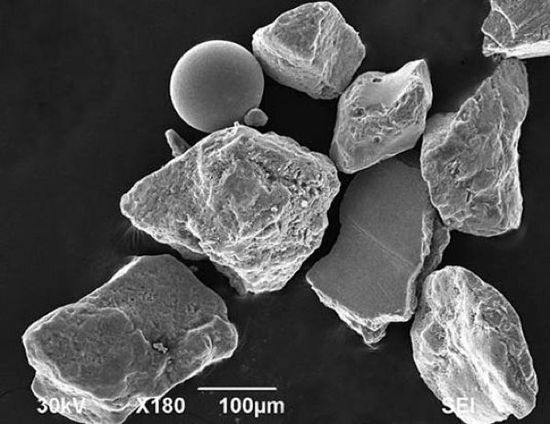 War Sand: As much as 4% of sand on Normandy’s beach is made up of miniscule fragments of steel, the remnants of shrapnel from WWII’s D-Day. It’s a story that’s part geologic wonder, and part reminder of what will be left of our civilization when we’re gone. That should make us very thoughtful, indeed. I had a weird moment in B’s kitchen last week. I was looking at the wall, and there was this thing that looked like moth-shaped confetti. I mean, it looked like a real moth, but kind of too smooth, and I’ve never seen a teal one before. The lighting was really super-difficult, and there was a table in the way, but as I looked, I started to wonder: could that be an actual moth? New at Rosetta Stones: Rainbow Fault Cake! We all like creative ways to illustrate geological concepts. My supervisor brought in a cake that turned into a glorious demonstration of a dip-slip fault. Recipe included. Go check it out! When you’re doing intensive geology in a group, it’s hard to slow down and photograph the flowers. But I got ye a magnificent one: a single lily on the banks of the McKenzie River, right before it plunges over Koosah Falls. I scrambled down as close as I could safely get and started snapping frantically. I’m home, alive, which was in doubt a few times during this whirlwind overnight to Oregon. First off, Fourth of July holiday traffic. Meaning folks who would do things like look me in the eye, wait until I was a few yards away, and pull out in front of me. Or who would decide they wanted my lane and wanted it now, regardless of the fact I happened to be occupying the space they wanted. But I’m a watchful driver most of the time, and my brakes are excellent, and the car understands how to stop or swerve quickly, so those incidents merely served as spice. So forget traffic. Let’s get down to bidness: geogallivanting with Anne, Chris, and Lockwood! Gone Gallivanting. Have a Kitten. ZOMG you guys, I’m finally meeting Anne and Chris this weekend! They’ve driven and flown a long way to get here. I’m driving down in the wee hours of Saturday morning so that we can meet up in Corvallis, and Lockwood’s taking us geogallivanting. Fun times! I owe Chris and Anne a healthy chunk of my career as a geoblogger. It’ll be lovely to thank them in person. I’m trying to fit in plenty of time with B, Kirby and Luna before I go. We spent a chill Fourth of July watching Alias and MMA and playing with kittehs. Fame doesn’t seem to have gone to their heads quite yet. Kirby spent a few minutes playing with his baby sister between jaunts in the nice weather, and Luna was just outstandingly adorable. Good thing, because she’s pretty much all you’re getting for a few days. I got to thinking today, “I’ll be there’s a geology story behind fireworks. Betcha I can be lazy and link to the people who’ve already written it.” And lo, it was so. I found you some great articles: explanations of the science (including geology!) of fireworks for both kids and adults, plus a neat-o experiment you can do cheaply, easily and safely your own self. How cool is that? Setting things on fire: almost always awesome. I also found you some gorgeous photos courtesy of folks on Flickr. Here’s the ones I couldn’t fit, but were too beautiful to pass up. Enjoy! 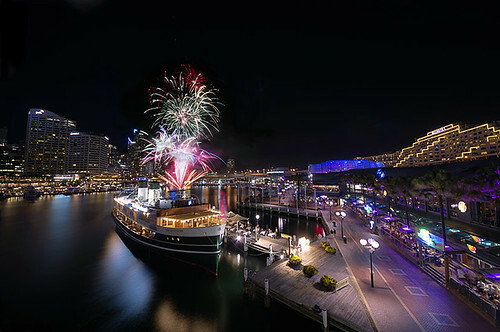 Fireworks over Darling Harbour. Image courtesy Nigel Howe. 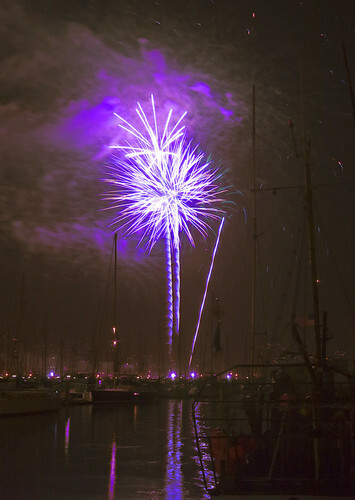 Fireworks in Santa Barbara, CA. Image courtesy Damian Gadal.